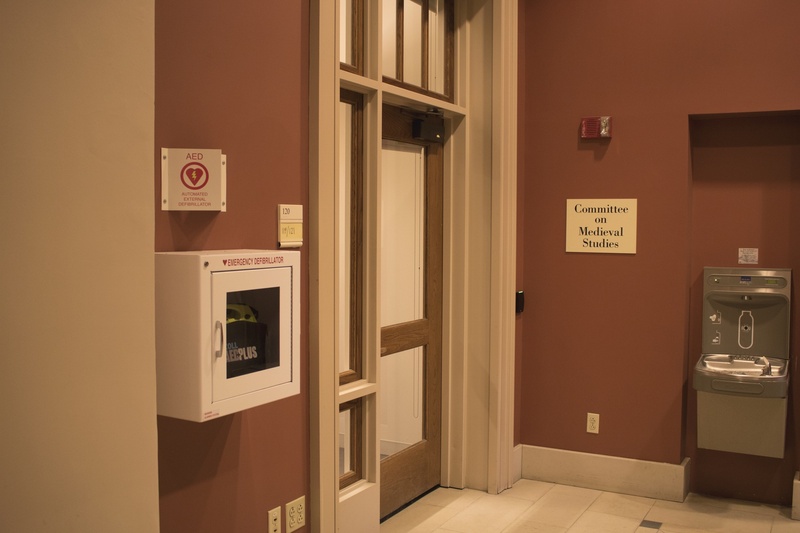 An AED box in the Barker Center. Two College students failed to convince Harvard University Health Services to put naloxone in AED boxes across campus. After taking a graduate-level course on the opioid crisis in the History of Science department, Kailash Sundaram ’19 and Eana X. Meng ’19 proposed in December that HUHS make naloxone available to Harvard affiliates and members of the greater-Cambridge area. Sundaram and Meng’s proposal had called for naloxone to be placed in every Automated External Defibrillator box across campus and in all Harvard University Police Department cruisers, for a total of approximately 400 units accessible to the public. They projected the total initial cost to be approximately $18,500, with an additional maintenance cost of $14,000 every two years afterward. Senior Director of Nursing and Health Promotion Maria Francesconi, who served as the HUHS liaison on the students’ proposal, informed Sundaram and Meng of the University’s final decision in an hour-long discussion, according to Sundaram. Francesconi reached her decision after consulting a group of professionals including HUHS Director Paul J. Barreira, HUHS Chief Medical Officer Soheyla Gharib, Adams House Faculty Dean John G. “Sean” Palfrey ’69, a lawyer, and a Harvard University Police Department officer, Sundaram wrote in an email. According to Sundaram and Meng, HUHS offered three reasons for deciding against the proposal: HUPD officers already carry naloxone, it is difficult to maintain up-to-date medication in AED boxes, and there is contradictory research surrounding the benefits of naloxone. “They had some skepticism about whether the research actually suggested that naloxone would be effective at Harvard,” Sundaram said. Sundaram and Meng, however, said in an interview that several studies confirm the lifesaving potential of the drug. Meng and Sundaram also said they were frustrated by HUHS administrators' emphasis on HUPD as an adequate public source of naloxone. “We're not so sure if that's an effective reason because, one, opioid users are often scared to contact the police because of fear of criminal repercussions,” Sundaram said. Sundaram and Meng also added that police response times can be too long in the critical moments of an overdose. When asked about the factors that went into HUHS's decision, HUHS Spokesperson Michael Perry wrote in an emailed statement that despite their recent decision, HUHS isn’t entirely opposed to the idea of naloxone being publicly accessible on campus. Narcan is the brand name for naloxone. Despite HUHS's stance, Sundaram and Meng said they plan to keep advocating for opioid awareness on campus and the need for naloxone to reach the greater-Cambridge area. In an emailed statement, Sundaram and Meng said their working group’s name will be Harvard for Opioid Overdose Prevention and Education — HOOPE for short. Meng and Sundaram have also created a petition for other students to show their support for the project and advocate for HUHS to implement it. The pair stressed that the importance of the initiative lies not just in expanding access to naloxone but also in educating the public. “What we were hoping to do with this project is not only about the naloxone in and of itself, but it's about the broader thing about raising awareness and definitely about de-stigmatizing the opioid crisis,” Meng said. “I think it's Harvard chance to be a leader and to raise awareness. So we're going to continue this effort,” Sundaram added.